One of the most epic bike races of the year, the Daytona Supercross, is now just around the corner. The race has seen its share of spills and thrills over the years and the fact it is held at one of the most famous venues in the country makes it that much more intriguing. The best racers going at it on a daunting track is what it is all about. So if you want to be a part of this high fueled event then book your Daytona Supercross tickets now and enjoy the experience. The Daytona Supercross is an AMA sanctioned event. The AMA is the body that governs the sport. Supercross is more or less like motocross but there still are certain differences. Supercross gets more exposure on the mainstream media and the races require more technical skills since the tracks are very tough to conquer. The sport began proceedings for the first time in 1972 and has since gone on to become one of the most watched and televised sports in the country. The Daytona Supercross is regarded by many to be among the toughest races of the year. The racers need to be on the top of their game to make it to the finish line. A lot of that is because of the venue, the track which has been put in place at the "Daytona International Speedway." The tri-oval shape of the race track will once again play its part in ensuring fans buying Daytona Supercross tickets get their money's worth. Supercross's association with the Daytona International Speedway goes all the way back to 197 which puts it at the top of the list of the longest running Supercross races of all time. The five time winner of this remarkable race, Ricky Carmichael will once again be designing the field to cater to this special Supercross event. He will be doing the honors for sixth year running. Needless to say he will do everything in his powers to make sure fans of the sport get to see exactly what this race is famous for, breathtaking action from the start right till the very end. James Stewart, the winner of Daytona Supercross in 2012 will lead the line. Joining him on the track will be the likes of Ryan Dungey, Andrew Short, Trey Canard, Chad Reed and the guy who has won the AMA Supercross twice, the one and only Ryan Villopoto. With such an array of stars taking part, the Daytona Supercross promises to be a memorable occasion. The Daytona Supercross has always been an action packed event that has kept fans hooked. It has a legacy which is unparalleled in the sport and the grueling race track adds that little bit of extra spice to the proceedings. 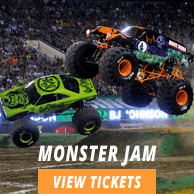 Fans know how special the race is which is why they don't miss out on Daytona Supercross tickets. With so much to look forward to who can blame them.